With every illnes out there right now I don't want to get any of them. I have been using the crosswalk buttons for many years but I don't want to touch them anymore for fear of getting sick. My suggestion is that we make new cross walks that are voice activated. On my phone I can speak to google and it will do things surely we can do the same with cross walks. Thanks and God Bless! I think we should outlaw leaf blowers in HB. Or at least limit their use to one or two days each week. In my neighborhood there are gardeners using leaf blowers Monday through Friday AND SATURDAY, all hours from 8:00 am until 7:00 (in summertime). Very few of us have so many trees on our property that the leaf blowers are truly necessary. How can we get this in front of City Council? Idea: How do we save our historic Hermosa architecture and houses? It seems everyday there is an old property being torn down to make way for a new one. I am all for developing and renovation, however many of our beautiful houses are being demolished for investors to come in and build spec homes. Is there a historic register of houses? How can we protect these houses? And how can we honor them? Allow responsible dog owners and their registered dogs in Hermosa Beach to use the strand AND beach from sunrise to 10 AM and 5 PM to sunset. Corresponding with this new rule, would be not allowing dogs on the strand from 10 AM to 5 PM to ease foot traffic during peak hours. This would be similar to Newport Beach's rules which allow residents to enjoy the beauty of beaches. This will also limit non-residents who walk their dogs on the strand, who may be less likely to clean up after their dogs because they do not have the personal connection to the city. If you want to limit the area of beach use, I would propose the northern border of 4th street to the city limits on the south. Dogs are never allowed on the beach or any beachfront sidewalk between the hours of 10:00 a.m. and 4:30 p.m., including the ocean front beaches and bay front beaches. Before 10:00 a.m. and after 4:30 p.m., dogs are allowed, if they are securely restrained by a substantial leash or chain not exceeding six feet in length and controlled by a person who is competent to restrain the dog. Idea: Follow up to tar cleanup on our beach. There appears to be additional tar buildup in the weeks following the initial cleanup after the Refugio oil spill. I should think the oil company responsible could send a smaller crew to do another cleanup. The tar clumps on the beach are still larger than what could be considered natural seepage. Idea: Well I certainly wouldn't put in a rifle range. I just now heard HERMOSA BEACH CITY COUNCIL MEMBERS (some of whom I voted for) just voted on and approved a rifle range in downtown Hermosa. Aside from the potential danger factor and very loud noise pollution this will create, it is planned near an elementary school, and is said to be replacing the "friends of the library". To HBCC: Are you guys F-kidding me?!?! This it an outrage. How could you approve something so controversial without taking the vote to the people? I for one, do not feel that you are representing the wishes of the people of Hermosa Beach on this one. I don't think I'm alone on this either. I have a feeling you will be hearing from many Hermosa residents in the VERY NEAR FUTURE on this topic. Who do you think you are anyway--Congress?!?! I certainly wouldn't put in a rifle range in an effort to improve Hermosa. I just now heard Hermosa Beach CITY COUNCIL MEMBERS (some of whom I voted for) just voted on and approved a rifle range in downtown Hermosa. Aside from the potential danger factor and very loud noise pollution this will create, it is planned near an elementary school, and is replacing the "friends of the library". TO HBCC Members: Are you guys kidding me?!?! This it an outrage. How could you approve something so controversial without taking the vote to the people? I for one, do not feel that you are representing the wishes of your constituency on this one...and I don't think I'm alone on this either. 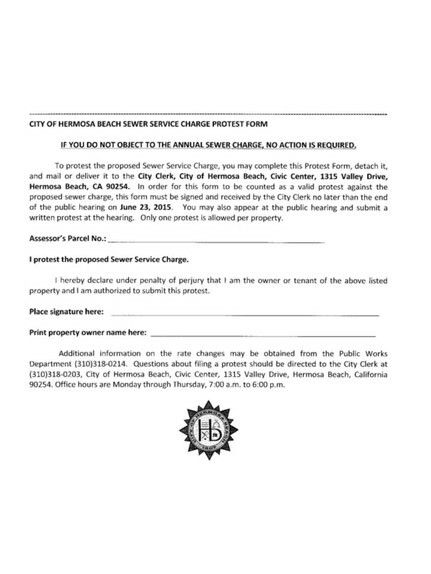 I have a feeling you will be hearing from many Hermosa residents in the VERY NEAR FUTURE on this topic. Who do you think you are anyway--Congress?!?! Have a place for local Senior to hang out during the day so they dont have to be every shut in. Meet others, which would help with depression and their mental out look on life. Provide monthly activities, a volunteer program for local business. And maybe a monthly food drive. 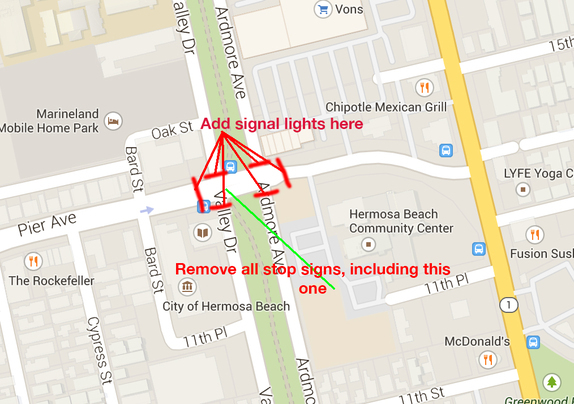 Idea: Equip intersection of Pier Ave, Ardmore Ave and Valley Dr with signal lights instead of stop-signs. This is a very busy intersection. Replacing stop signs with signal lights will allow for smoother flow of traffic on Pier Ave, and prevent cars traveling on Ardmore Ave and Valley Dr from speeding while trying to make it through the intersection. This will also make it safer for pedestrians to cross the streets. The strand,sidewalks private property and parks smell of dog urine. Please consider passing a ordinance or law that requires dog owners must carry and use poop bags and spray bottles with white wine vinegar or other non toxic pet urine removal spray if they are going to walk their dog an allow the dog to poop or urinate on public or private property.